Artists have been painting peaches for at least two thousand years (there is a mural in a villa in Herculaneum, and a YouTube video of how to paint peaches); beautifully coloured, interestingly rounded and creviced, they look deceptively simple to reproduce, but the velvety texture and misted bloom defeat many artists. 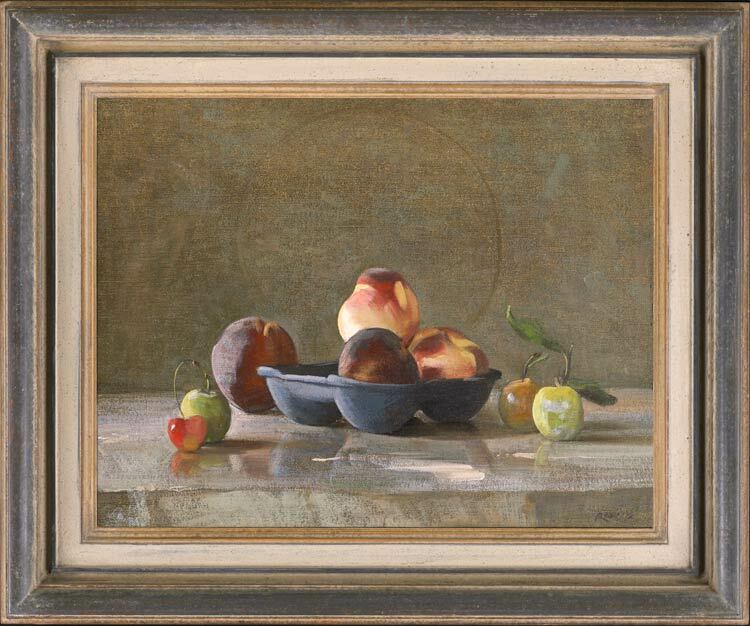 Stephen Rose’s ability to capture these nuances of surface is displayed with panache in this classical still life – the soft plush skins of the peaches set against the harder sheen and bloom of the greengages and the translucent glow of the cherry. The fruit is further contrasted with the gleaming stone shelf where they sit, and the soft, cardboard texture of the supermarket fruit tray. Once more a modern container – the detritus of our consumerism – is given a Chardinesque grace, and the enigmatic detail of the circle inscribed in the background gives a metaphysical edge.